Paver Sealing and Cleaning: Protect Your Investment! Paver Sealing: We don’t just design and install custom paver patios, driveways and pool decks- we clean and seal them too! We use industry-approved cleaning solutions to address those stubborn paver stains. Ideally, cleaning your pavers shouldn’t happen only when there’s a spill; rather, periodic cleaning will help protect the surface and prolong the life of the pavers. View our cleaning and sealing photo gallery here! Sealing your pavers will protect the pavers from various environmental elements, therefore protecting your investment, and keeping your pavers looking in great condition. Our sealants offer UV protection, and will protect the pavers from damaging tropical rainstorms. We will also inspect your paver surfaces for signs of grout loss. In a few years, you may need a re-grout, and we may recommend sand or a polymer sand instead. Polymer sand is intended to improve the paver interlocking system. The paver’s interlocking system is improved, and the grout (sand) won’t be washed away. It also helps in controlling weed growth between the pavers. We can help you care for your existing paver surface- just give Apex Pavers & Pools a call! Contact us to schedule an appointment today. 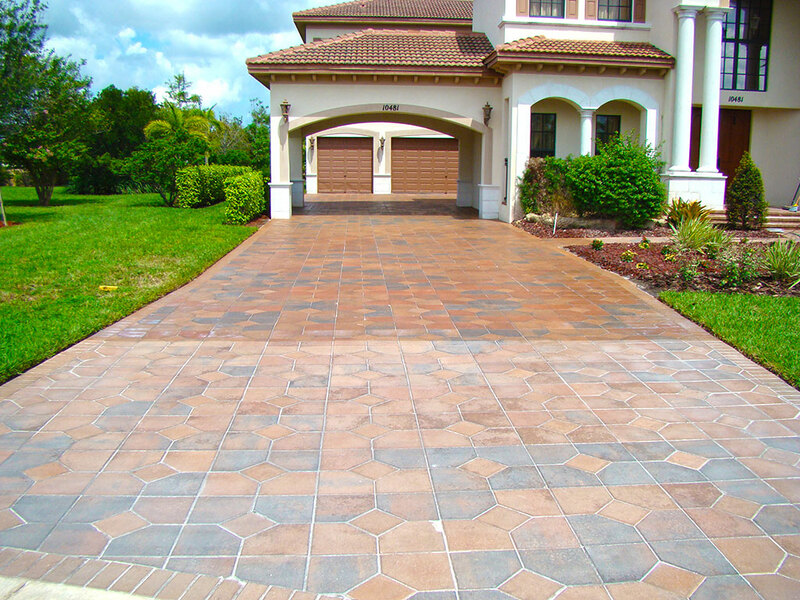 Curb Appeal and Functionality – The two most important points to consider when designing a paver driveway. Driveway pavers that complement the home’s exterior, creating a path for driving cars and walkway space, and withstand the weight of vehicles is the ultimate goal when selecting driveway pavers. Once the overall design is finalized, the paver material, style, pattern and color will need to be selected next. Our driveway paver specialists will work with you to design the driveway walkway and select the paver shapes, sizes and colors. Patterns: Traditional patterns such as Herringbone and Basketweave offer good stability for high traffic areas. The Ashlar pattern is more modern and offers the same stability, while Circular patterns as shown above create a relaxed feel to the home’s exterior. Borders: While it might be tempting to match the border with the rest of the pavers, consider a different shape, color or texture than the rest of the pavers. This can add interest and a luxurious look to your driveway and create continuity to the exterior of your home. If you’d like to speak to one of our paver specialists, please contact our team today to make an appointment: 772-419-5151 (Treasure Coast) or 561-844-9370 (Palm Beaches).